« So You Want Your Child To Go To College…Ok…How? My chairs are progressing, albeit, not as fast as I would like. They are continuing on and finishing their foundational elements, which is what today’s post features. 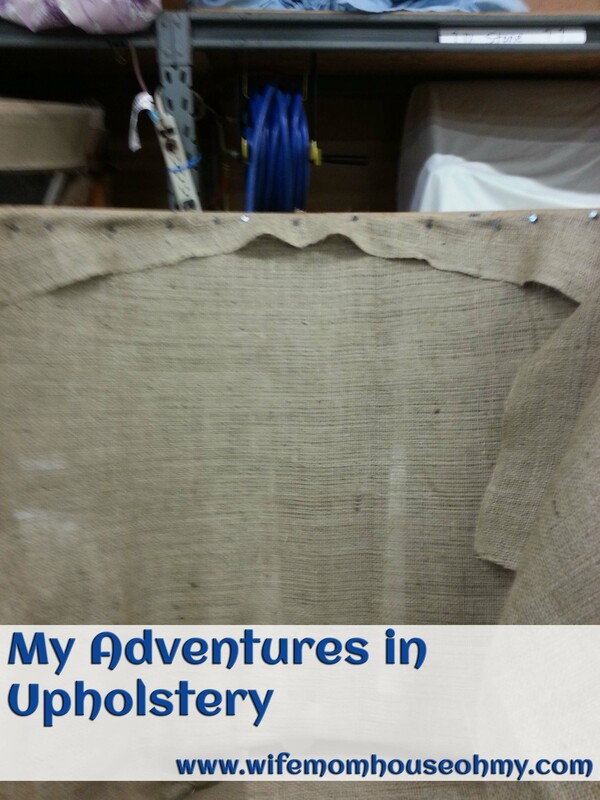 If you will remember from the latest My Adventures is Upholstery post, I added the extra twine binding to the springs and burlap to make one solid moving base. An absolute necessity in case you happen to have some little or not so little people who don’t sit in chairs properly. It keeps them from busting a spring. The rest of the foundation serves a similar purpose. The back and arms of the chair are the weakest points so it was important to make sure they offered the proper support while acting as the foundation for those elements. I’m not sure in your house but I have an arm sitter, a flop down hard sitter and a press against the arm sitter…my stepson. So these chairs need all the help they can get in staying strong. If you will remember from earlier, I already had to do a repair from someone dropping it. To do so, it is getting a double whammy of strong webbing and burlap. An example of traditional webbing…my mom’s chair. Think back to when you were a kid and they had these folding chairs with woven plastic strips. 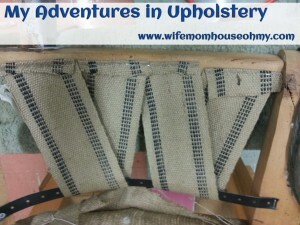 The strips themselves were woven (or webbed) together too. This is pretty much the same concept except the webbing is thicker and made of heavy duty fibers. Typically you would apply it in vertical strips to the back and the arms. Pretty simple actually. You can see an example in the first picture. You fold the edge of the webbing over and align it with the frame of the arm and staple it in place using 7 horizontal staples. Then you pull tightly and staple horizontal 7 staples to the webbing at the bottom of the arm. 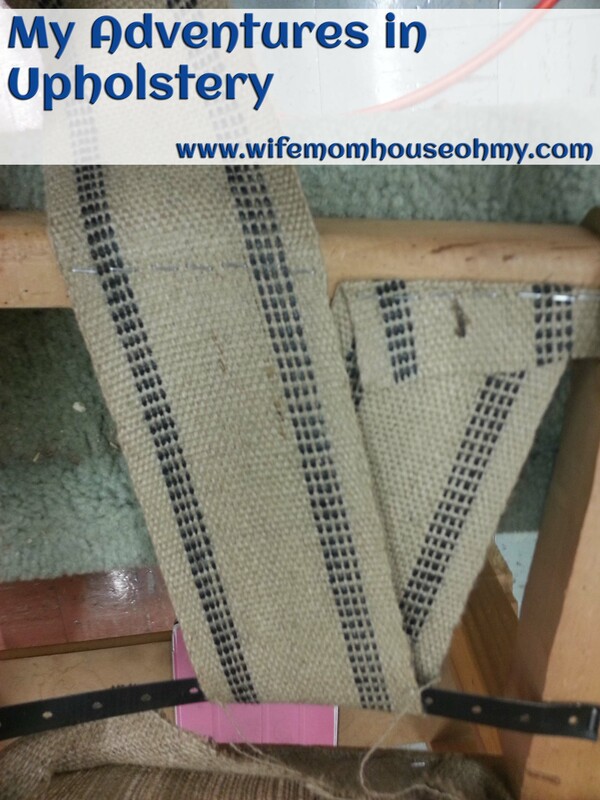 Then fold over the webbing back over the strip and staple it slightly above the previous row of staples. Cut and repeat along the whole side of the arm, the other arm and the back. Tip: Keeping the staples horizontal to webbing and arm and in a straight row helps to ensure the staple grabs as much of the threads in the webbing as possible. This helps in maintaining the chairs strength. In other words, it helps prevent blowouts. I said typically. Key word. My chair is missing a key element and in its place is a metal strip called “plumber’s tape”. It should be a wooden element, not “plumber’s tape”. (It’s not that plumber’s tape is wrong per say, its just a sign of a short cut and therefore a poorer made chair.) Let me start off by saying, I HATE PLUMBER’S TAPE. Okay, that said, let’s move on. Because I have this cheap element to my chair, instead I start off the same but apply the webbing at an angle. Wrap it around the plumber’s tape pulling tightly and back up to the arm. Then I staple it in place. It sounds easy but with each one you do, the $*%! plumber’s tape moves and shifts making the webbing you just applied loose. Then you unstaple – major pain – and do it again. You do this on both arms and the back. I can’t promise that no little explicatives escaped my mouth during the process but I tried. As you can see, you staple the end before you fold over and staple again. I did get the webbing all on and feel pretty good about it. Its a little loose in places but it is the best that can be done. Now on to burlap. It was bound to be easier. 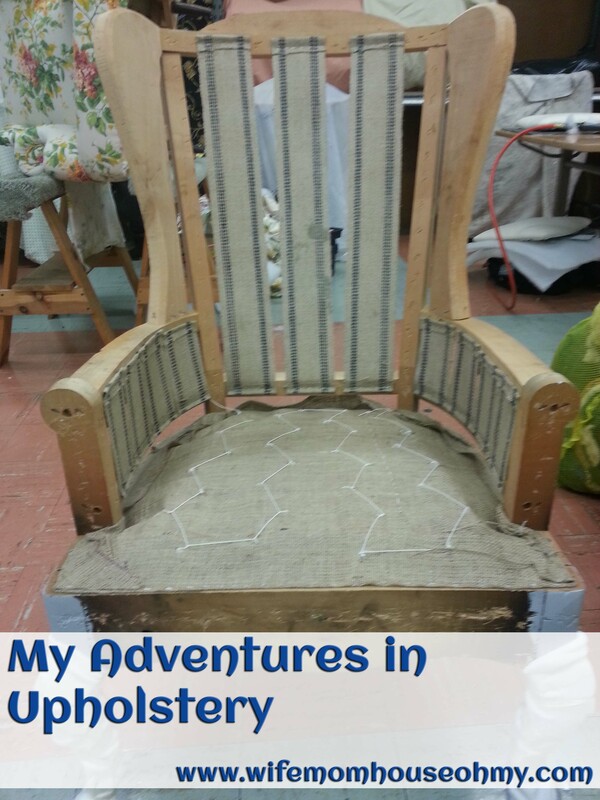 My chair with webbing finished. Note the plumber’s tape and the angled webbing. 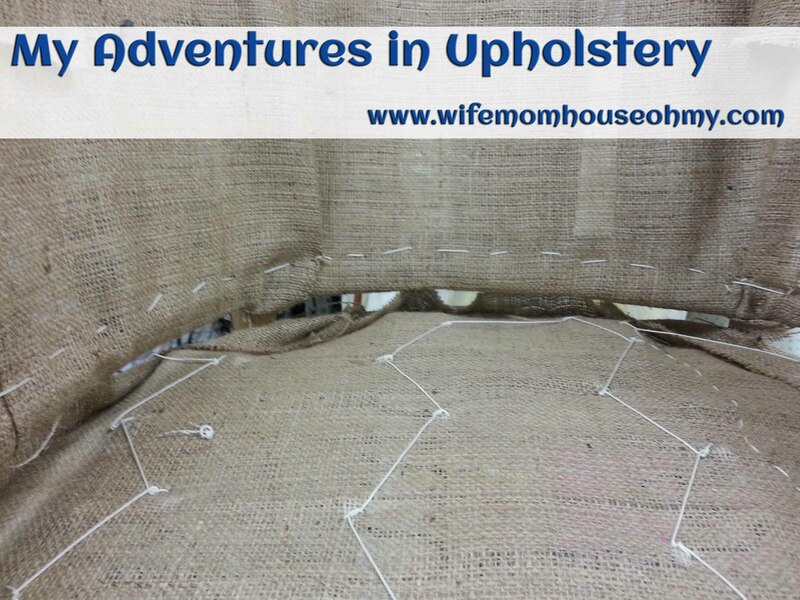 Typically, you cut your burlap to size plus two inches. You center your burlap and staple in the same fashion as the webbing to the top and bottom of the arms and a separate piece for the back. Typically. Remember that plumber’s tape…I hate plumber’s tape. Continuing. 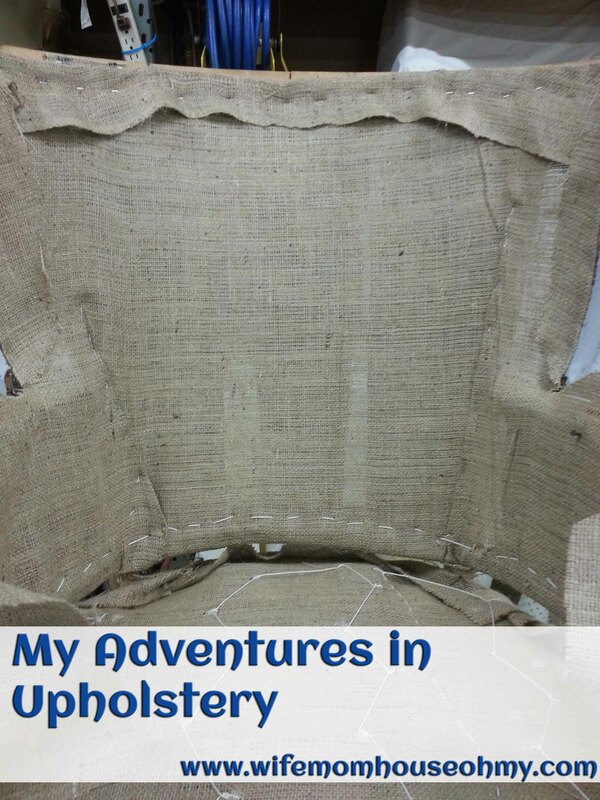 On my chair I used a single sheet of burlap to cover the back and both arms and cut it to shape leaving a two inch allowance. 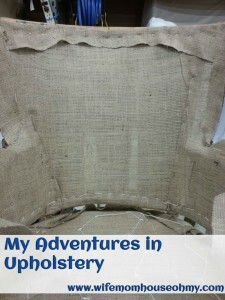 First, I tacked the top of the burlap, plus two inches, to the top of the chair. This would serve as an anchor while I hand stitched. (Now mind you hand stitching was way better than the industrial machines so I was okay with hand sewing. This was a positive.) 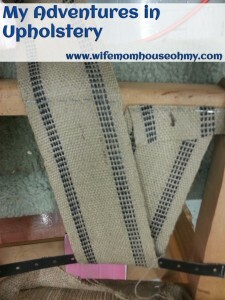 With the plumber’s tape, you wrap the burlap from the inside around the plumber’s tape and back up two inches. Then you hand stitch it in place. You do the best you can around the leg/back support and do the same with the arm. 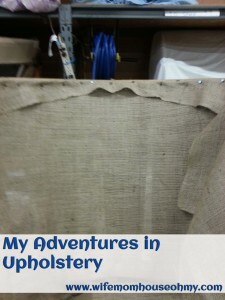 Tack in the burlap but not completely. They need to come out. Then you remove your tacks from the top. Pull tightly (leave a little give for sinking in when someone sits) and begin to staple in place, starting at the center and working out. Repeat on the arms. To deal with the extra, you fold it toward the center of the back. You want the straight edge of the folded flap to land on wood. You then staple it down. Most important is to keep a flat and flush surface as much as possible. All stapled in place. You can see the fold at the arm and back joint if zoomed in on the image. Okay, I’ll admit, its not hard. In fact, its pretty easy. It was just time consuming. My mother is working on another chair at the same time. Doing the same step took me three times as long as her because of the plumber’s tape. 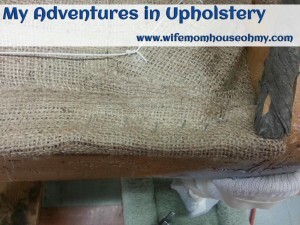 Finishing up my burlap stage, I needed to add one other element. An edge roll is basically a compact roll, either made of fabric or heavy paper. It acts as a berm, to give shape, and the help provide structure. In the case of my chair, the edge roll I added was to the front. It will add structure and a berm. Its going to keep the cotton I add in the next stage in place but it also acts as a barrier between the hard edge of the wood and the person sitting in the chair. To add it, I simply cut it to size so that it went all across the front of the chair. 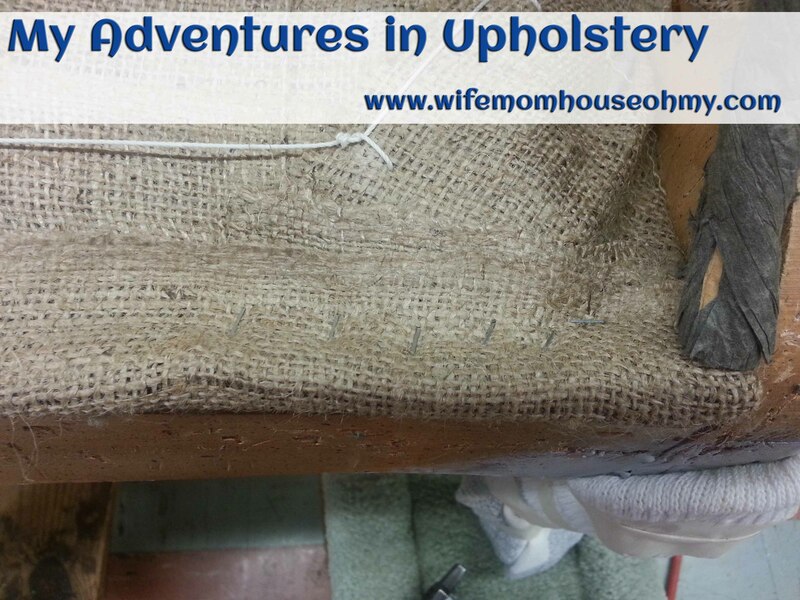 Next, I cut a strip of burlap so it could wrap around the strip (see photo) and leaving about an inch of edge of burlap so I could attach the edge roll. I also left 2 inches on each end. 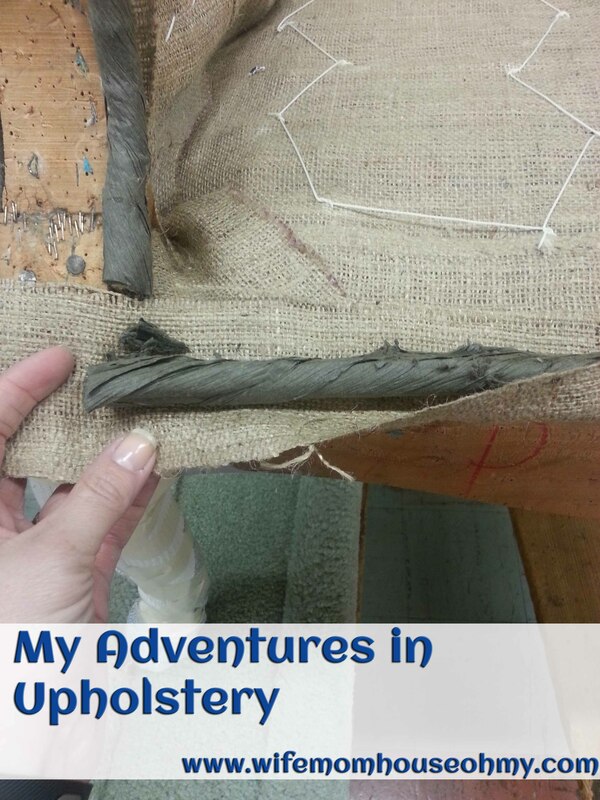 Once wrapped in the burlap, I place the edge roll so it lined up with the edge of the front of the chair and stapled it in place. 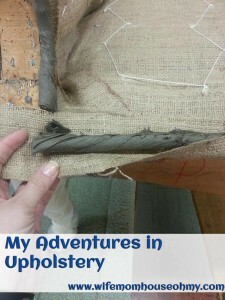 Because you want it to be secure and not roll, you overlap the staple so it staples into both the edge roll on one side and the wood and burlap flap on the other. Fold the ends over and in toward each other. Staple in place. Note that the staples are at a slight angle but go into both the edge roll and the wood. This is one of the exceptions to straight stapling. All done. 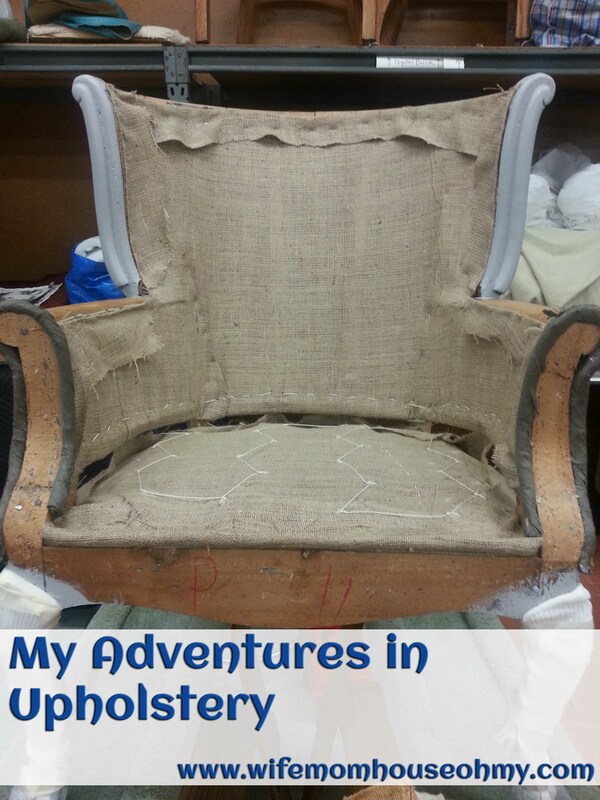 Its starting to look like a chair again. 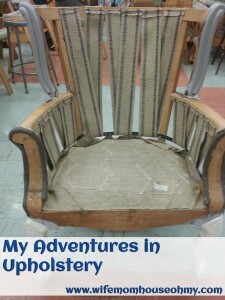 I’m seriously thinking about starting a new trend…unfinished chairs. Leave them at the burlap stage and let them be a statement piece. Okay, not really. Next up is adding the stuffing and the seat. Its the cushy stuff. 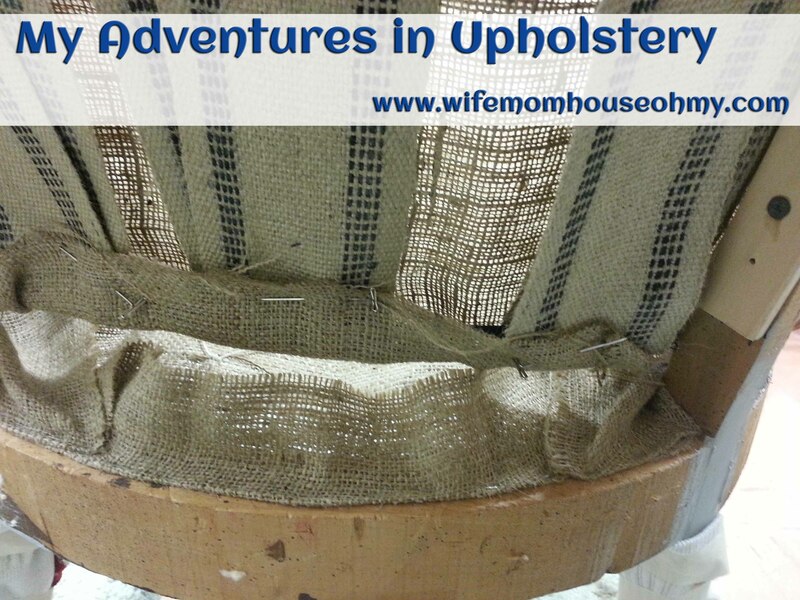 Foundation of webbing and burlap…done! Until then, see you next post!